I made Fresh Strawberry Curd and I dedicate it to my Nonno Sam. It's made with fresh strawberries that I picked myself. He would've loved that. He loved food and he loved his garden. He never grew strawberries but he grew plenty of grapes, tomatoes, eggplant, cucumbers, celery, peppers, leeks and herbs. He would walk his garden everyday and tend to it diligently. He was proud of everything he created, from his homemade wine to the Friulano cheese that he aged himself in his cantina. Most of all he was proud of his grandchildren. My Nonno Sam passed away peacefully over the weekend. He was the strongest man I've ever known. He lived a difficult but fulfilling life, having survived 6 years serving his country in the war overseas and then immigrating to Canada from Italy to raise four children. He was also a simple man who wanted nothing more than good company, a healthy family and good food. Nothing made him happier than seeing the faces of his grandchildren and I hope he knows that nothing made me happier than seeing the twinkle in his eyes. I love you Nonno and I will miss you always. This strawberry curd is lovely filled into tart shells. You could fill it into this pie crust and top it with toasted meringue. It would be a refreshing filling for a summer cake that's covered with whipped cream and topped with fresh berries. 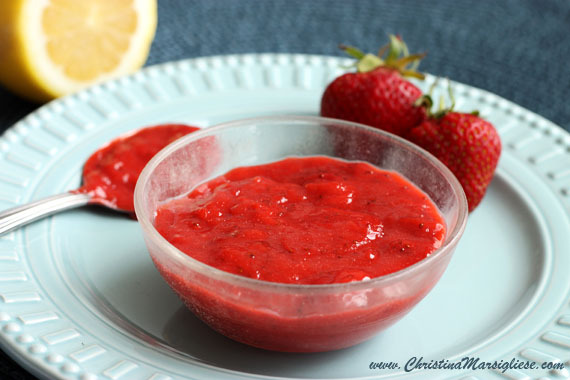 I hope you take advantage of the end of this gorgeous strawberry season and use the last of your berries in this recipe that showcases their freshness so vividly. So sorry to hear about your Nonno's passing. I hope you and your family are coping well. That's a great picture of him by the way. 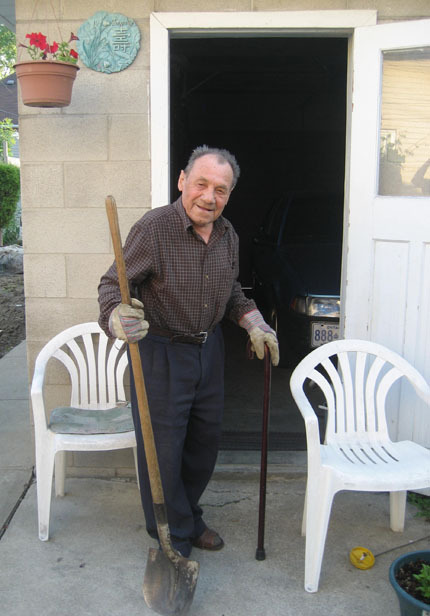 Typical Italian grandparent: cane in one hand and shovel in the other! @Samantha Angela Thank you Samantha. He truly was a stereotypical Italian Nonno and he will be missed tremendously. oh i am so sorry about your grandfather! its always hard losing someone u love, but at least u have fond memories to keep him with u always. 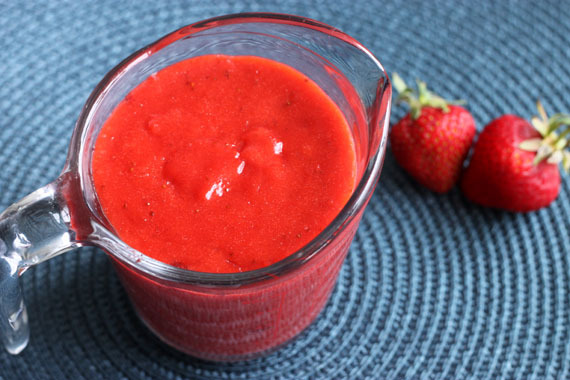 Your strawberry curd looks gorgeous. 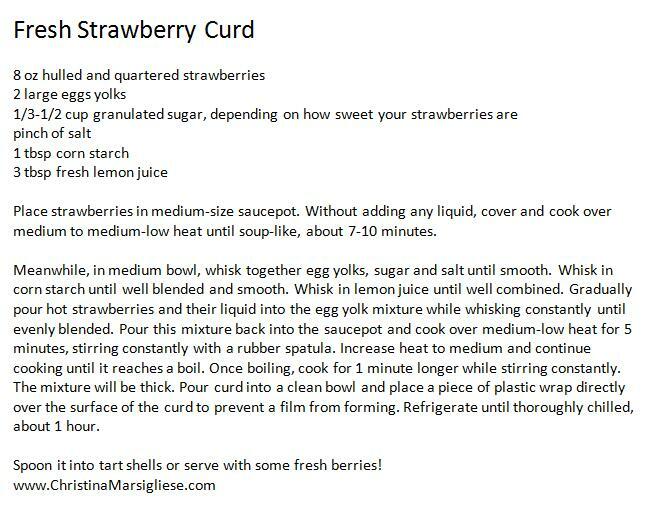 I never thought to make a curd with strawberries but I'm going to try it soon. It's so bright and looks delicious! I am sorry that your grandfather has passed, but he will live on in your memories and your heart. Lovely tribute. Cool idea, making a curd out of strawberries! I am thinking of all the great baked goods you can use this in-delicious. What a beautiful post! I'm so sorry to hear about the loss of your grandfather. You and your family are in my thoughts and prayers.